The magnetic core drilling machines of the Prof iPLUS category have in common a high degree of flexibility for drilling, reaming, countersinking and thread cutting. These machines are equipped with REVERSIBLE MOTOR which provides easy tapping operations. these machines are also equipped with magnet indicator, overload shutdown, friction clutch, oil bath gearbox, KEYLESS drill chuck, Full wave control electronics, Speed and Torque controls, etc. Modelaavailable are MAB 485; MAB 485SB; MAB 525; MAB 525SB; MAB 825; MAB 845 & MAB 1300. 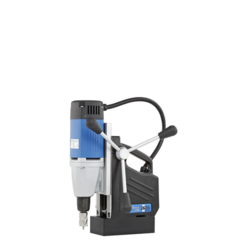 The made in Germany, MAB 825 Mag Drill - The unique feature of MAB 825 mag drill is that the it is equipped with reversible motor. A reversible motor of the mag drillis absolutely necessary to do rreversible motor of the mag drilltapping or thread cutting. Once the tapping is finished, with reversible motor of the mag drillyou can remove the taps at the entry of the holes, which helps prevent the threads to get damaged. reversible motor of the mag drillis also useful for right hand as well as Left hand taps. With a reversible motor of the mag drillthere is no need of extra tap-head attachment. Powerful & Reliable, 16 Amp double-insulated motor, 4-speed oil bath gearbox for applications requiring high power, Designed for continuous use, Infinitely variable torque control and full-wave control electronics, Drill up to 4" dia. & Tap up to 1-1/8" dia., Uses annular cutters, Twist drilling and reaming up to 1-1/4" dia. Tapping capacity 1-1/8" dia., Optional geared chuck IBC 21, Integrated cutting oil reservoir, Automatic internal lubrication, Automatic feed (model MAB 825 V), ideal for production applications, Swivel base (model MAB 845), Keyless Cutter Mount, Quick-change keyless cutter system for 3/4" Weldon shank, Arbor for 1-1/4" Weldon shank, Integrated Safety, Green/Red LED magnetic force indicator for safe operation, Internal cable routing, Simple, ergonomic arrangement of controls for one-handed operation, Emergency-off function. 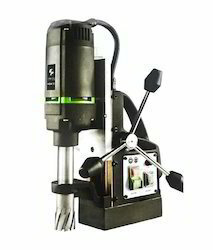 MABasic 200 Magnetic Drilling Machine. Made in Germany. for the benefit of good prices. The made in Germany, MAB 845 Mag Drill. 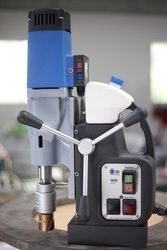 The MAB 825 magnetic drilling machines can also be bought with a Swivel Base option (the model is then called MAB 845). 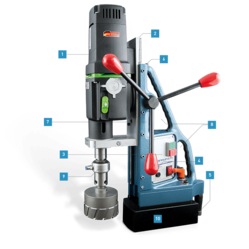 The Swivel Base is an adjustment device on BDS magnetic core drilling machines, which helps the operator to position the machine â€even under magnetic condition.â€ The operator can move the machine 30Â° left or right and 20 mm backward or forward that too when the magnet is activated. This is a useful when drilling multiple holes close to each other (like on boiler plates) or when drilling in vertical position or overhead position. Overheat protection. One of the very useful feature of MAB 825 / MAB 845 specially for new operator is the overheat protections. Due overload or improper handling of the machine while drilling the machine may get heated and due to heat the motor may get damaged. The BDS magnetic drilling machines protects the machine from overheat by shutting down the motor when the sensors senses overheat, this prevents in damaging of the motor. After the motor is shut down by the overheat protection, keep the machine idle for 30 seconds to 1 minute and then run the run the motor again without drilling. Run the motor for a minute and then start to drill again. This feature increases the machine service life as well as avoids accidents. 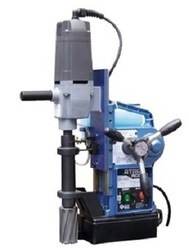 Equipped with SWIVEL BASE the Made in Germany MAB 525SB magnetic drill press Robust and lightweight! With two-stage oil bath gearbox,thread cutting up to M 20.
variable speed and torque controls. The new Karnasch magnetic core drilling machines offer a complete bandwidth of machines in the pro segment for many different areas of use in steel construction. Development and selection of the components of the new machine generation was subject to the principle "ONLY THE BEST"to warrant longevity, high-quality processing and thus a low maintenance effort. Eibenstock high-performance motors "100% MADE IN GERMANY" contribute to outstanding torques. Capacity Hole Diameter 1-3/8" max. 2" max. 1-9/16" max. 2" max. 2-9/16" max. Depth of Cut 2" max. 3" max. 1-3/8" max. 2" max. 2" max. Magnet Dimensions (inch) 3-5/8" x 8-1/2" 4" x 8" 3-1/4" x 6-13/16" 3-15/16" x 7-15/16" 3-15/16" x 7-15/16"
Looking for Magnetic Drilling & Tapping Machine ?